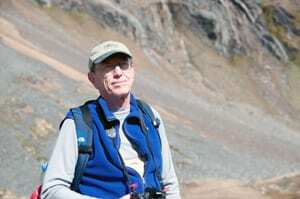 Oceanographer Phil Richardson formally retired in 1999, but that hardly diminished his passion and curiosity. Last year, he combined his scientific knowledge with longstanding interests in sailing and flying to show how albatrosses elegantly take advantage of winds and waves to fly long distances over the open ocean without flapping their wings. 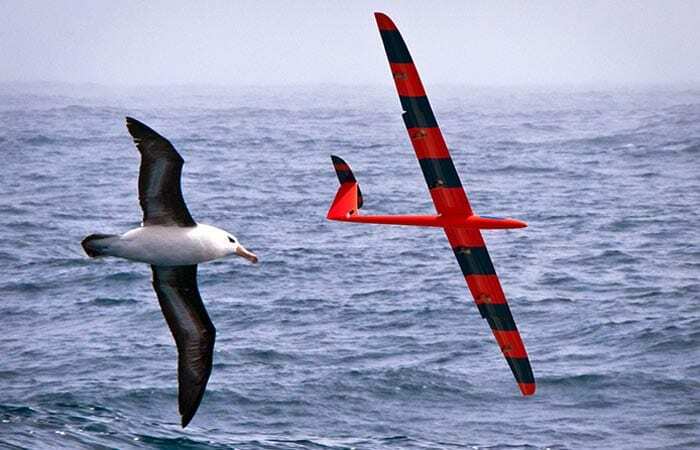 Now he is working with radio-controlled glider pilots to see if they can harness the same power source to develop a high-speed robotic albatross—an unmanned aerial vehicle (UAV) that could soar over the ocean on surveillance, search and rescue, and environmental monitoring missions. Richardson first became fascinated by albatrosses’ spectacular swooping flight when he watched them during a 1997 research cruise in the South Atlantic Ocean to study his specialty, ocean currents. He put the idea on his bucket list, and when he had more time, he went back to figure out the physics of albatross aerodynamics. In 2011, he published a study in the journal Progress in Oceanography, in which he examined the details of the albatrosses’ strategy, a phenomenon called “dynamic soaring.” It is based on a boundary layer (called a “wind-shear layer”) that extends above the waves: Above the layer, winds pushing the waves are also blowing fast over them—progressively faster as you ascend; below the tops of the wave crests, the waves block the wind, creating a region of weak winds on their lee side. In his research, Richardson browsed for “dynamic soaring” on the Internet. He found that hobbyists who flew radio-controlled (R/C) glider planes had begun to exploit the same strategy since about 2000. Instead of waves, however, they used mountain ridges. They guided their gliders toward a ridge crossing a wind-shear boundary where winds blew fast over the ridge top. Using this technique, they dramatically accelerated their planes from previous top speeds of about 170 miles per hour to a new record of 498 mph, achieved in March 2012. Richardson realized that these glider pilots had worked out details of high-speed dynamic soaring. He struck up correspondence with them and was invited to watch them flying their aircraft at Weldon Mountain, a mecca for R/C glider pilots above Lake Isabella, Calif. Soon Richardson’s mind was calculating. Albatrosses reach average speeds of 36 mph, he said, but dynamic soaring would allow them to fly much faster if the high speeds didn’t cause excessive force on their wings. The wings of R/C gliders, however, are stronger. “Could dynamic soaring be used by an unmanned aerial vehicle for high-speed flight over the ocean?” Richardson pondered. He pursued this line of inquiry, and the results were two new research papers published April and June 2012 in a journal that rarely gets submissions from oceanographers: R/C Soaring Digest. “I had a dynamic soaring model for albatrosses flying slowly,” Richardson said. After observing at Weldon, Richardson extrapolated his soaring model to fast-flying gliders, factoring in their mass, lift, drag and a few other factors specific for planes rather than birds. Richardson concluded that as long as sufficiently fast winds and large waves generate troughs and strong shear layers above them, “then in principle, dynamic gust soaring could be used for high-speed flight over the ocean.” He calculated that dynamic soaring could allow UAVs to fly about 10 times the speed of the winds. Gliders would have a few limitations that albatrosses don’t, however. First, in the low-level part of a swoop, albatrosses fly so close to the ocean surface that they often graze the water with their wings. Gliders can’t risk flying so low, because a glider wing hitting water could well cause a crash. Second, faster speeds cause more drag; to compensate, gliders need to make quicker swoops to cross the wind-shear boundary more frequently. Consequently, gliders’ loops are roughly 400 feet in diameter, compared with 167 feet for an albatross flying at 36 mph. Third, if winds died down, an albatross could start flapping its wings, but a robotic albatross would require a backup power source. 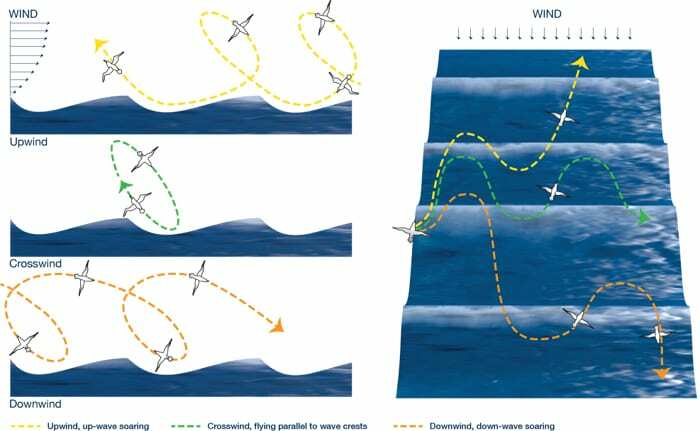 “To test these limitations, it would be beneficial to have experienced R/C glider pilots take high-performance gliders to sea and experiment with field trials to measure how fast dynamic soaring could be accomplished in real winds and waves,” he said. Envisioning the future, Richardson said a robotic albatross UAV could be developed to measure and respond to changes in wave crests and troughs, wind fields, and obstructions such as ships—much the way underwater autonomous vehicles now navigate their environment. And like their underwater counterparts, a dynamically soaring UAV could survey large areas quickly over long time periods without requiring much battery power. Equipped with various sensors, it could help locate sailors in distress, protect harbors, or monitor whale populations or currents. Richardson’s new glider pilot pals are keen to pursue the idea, and he has also contacted a few robotics companies that are interested. Albatrosses extract energy from winds to soar, as seen in these diagrammatic views from the side (left) and from overhead (right). LEFT DIAGRAM: Above a wave, winds blow progressively faster the higher you ascend. As albatrosses rise at an angle from a relatively windless wave trough, they cross a boundary into an area of brisk winds. They abruptly gain airspeed, giving them a burst of kinetic energy that allows them to climb to heights of 10 to 15 meters above the ocean. Then they bank downwind and swoop down into another wave trough, adding airspeed as they cross the boundary in reverse, and begin the cycle again. The Decline and Fall of the Emperor Penguin? from Progress in Oceanography, Vol. 88, Issues 1-4, January-March 2011, Pages 46-58 (Subscription required).